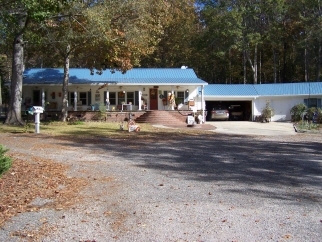 Country property with home and business space. This property comprises two separate lots that total the 5.53 acres. Interior Features This home has an open floor plan with laminate floors, electric fireplace, sun room, soaker tub in master bath, and security system. The kitchen has a new range with double ovens. There is a great room open to the kitchen and dining area and looks into the family room. Great family space! There is also a new water pump for the well, new water heater and traansferable termite bond. Adjacent to the garage is 1,007 sq. ft. of storage area! Exterior Features There is a large covered front porch even with plumbing for easy plant watering! There are Gutter Guard gutters, in ground sprinkler system (front & back yard) The home has a metal roof and patio. There is a pond with fountain which adds to the landscaping. Additional Features and Amenities Included is a 50.3'x37.4' detached building that includes 4 drive-in garage doors, office, storage and bathroom. This is a wonderful opportunity to have a business where you live, or have a space for the hobbyist or collector.